If it's possible, Cirque du Soleil is getting better—not because they keep finding more amazing talent than those they have consistently featured, but in the thematic artistry of their presentation and the creative variations that they develop to exhibit the breadth and depth of the performers they discover and attract. 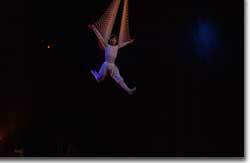 Varekai, their fourth production to appear in Denver, is their best road show yet, bringing together Cirque's usual out-of-this-world costuming, music, and performances, with sophisticated clowning and a more cohesive metaphor than past efforts. In this case, we follow a sequel to the story of Icarus, starting from his tragic flight too close to the Sun, through netherworlds where he meets a chartreuse goddess, then their separation and trials, and finally, their eventual reconciliation. This is not to say that these events actually provide a definitive storyline, any more than the symbols of one's dreams compose a narrative. 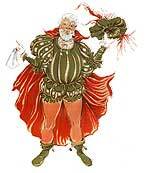 But they do provide enough nuances upon which to hang one's imagination. Accompanied by dynamic wall-to-wall live instrumentation and voice, with electronic effects, the opening parade of anthropomorphic lizards and other assorted funnel-eared, spiral-headed, cocoon-wrapped creatures emerges from a bamboo forest and fills the stage with a conglomeration of life forms more diverse than Ringling Brother's elephants and tigers and infinitely more bizarre. From this assemblage, as in an overture, major themes of the production are introduced, including dancers, acrobats, gymnasts, trapeze artists, contortists, jugglers, and clowns. Then Icarus falls from the sky, his once wax-held wings removed by a death-peddling zombie with spiderish tastes, who entombs him in a silken net. Icarus fights for his life and, in a respite from his bonds, meets a chartreuse diaphanous-winged princess. He dallies and feasts with her while a carnival ensues. 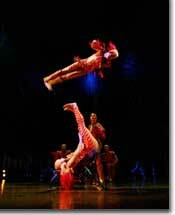 First up are a group of acrobats who perform the impossible: one spinning another with his feet until the critical r.p.m.s are achieved, when the generating partner flips his fare into the air, where this fellow in turn arights himself in mid-arc, and lands feet to feet with his partner! As the audience was retriving its collective jaws from the floor, during the interlude between acts, the ominous spider-zombie returns to threaten our chartreuse heroine, but we are left hanging as three Chinese double-sided-bolo artists take the stage, flinging roped pairs of weighted balls across the ceiling of the tent, catching them around their necks and arms as they perform various tumbling feats, while the rest of the creatures applaud from their roosts among the bamboo shoots that form the background to the arena. In a change of pace, a spoof on the classic "magician and his assistant" routine returns us to the traditional genre of the arcade sideshow, except that the suave maestro and his comely second have been supplanted by a greasy Lothario and a gravity-challenged, bobble-headed dumpling who delights in giving us glimpses of her ample matronly cotton underpants. Their epic ineptitude, though, wins us over, as we watch them perform the to-be-expected audience member abduction and enlist the innocent in their ever-escalating shenanigans, ending with a big bang. I enjoy this sophisticated metaphor more than any of the political cartoon I've seen lampooning the Bush-Cheney junta's operations in Iraq, though it sadly reminds me of that vainglorious imperial adventure. We then return to our story, where Icarus and his sweetheart are about to escape from their predators, the spider-zombie and his henchmen, via a magical balloon, but are kidnapped by turquoise green ectodermic trapeze dancers and aerialists, spotted, in lieu of a net, by crimson-drapped Georgian strongmen. Icarus watches helplessly as his princess is silk-encrusted by the web meister, while Renaissance singers underscore the tragedy of the moment. Then it's time for the Georgian strongmen to show us what makes them tick, as they break into a whirlwind of high-kicking dances native to the steppes of their Caucasia, joined by scarf-armed, leather-booted Valkyrie-ballerinas, spinning with sticks and swords into Intermission. Refreshments in hand, we wander the arcade, perusing the commedia dell'arte inspired masks and, here and there, some branded chique clothing. When we return to the big top, we find Icarus rolling in on a German Wheel, as contellations of fireflys glimmer above and a panolply of hive-headed tropical totem shoots, waddling aloe blastulae, and lace-sprouting spine-encrusted body skaters celebrate. For a breather, the hapless magician returns with his matinee-idol wannabee lounge act, forever chasing elusive spotlights that tantalize him, always a step ahead. Icarus then reappears, chased off by a banchee on crutches, while attempting to regain his wings, reminding us that this is still his purgatory. Twin bunjee-jumping impressionists with pre-Columbian biker doos spin interlocking mandalas, morphing to mirrored Mercurys, then incarnate as ascending solar ring-masters. Next, the proverbial question of screwing in a light bulb is answered by a socket-headed chap who is hung by his feet and spun with abandon by the local deatheater. The balloon finally returns with the Rubenesque princess who turns out to be a world-class yogini, performing single-handstands atop a rotating axle. Her routine obviously impresses the surrounding menagerie, kicking off a parade that turns into a royal retinue, ending with Icarus and his mash enthroned upon a folding pagoda. The reunited couple is entertained by another otherworldly parade, ending in a vibrant ensemble of Aztec canonballs, vaulted from swinging sleds across the ring and onto canvass sails. The fireworks culminate with a flurry of space shots, leaving only a few realists with their feet on the ground. 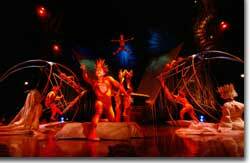 Cirque du Soleil's Varekai runs through July 11th. 1-800-678-5440 or cirquedusoleil.com.